Exactly one month from today, I will be making the voyage over to the East Coast for my new research position at Tufts University. My heart rate goes up every time I say it. What am I going to miss the most about California? Warm weather, asian food, friends&family (of course, not in that order)! I am hoping to get together with as many friends as I can before I make the big move. I invited my dear friend Lauren (the gal who introduced me to Pinterest long ago) over for dinner on Tuesday. She is an amazing cook, so the pressure was on. For the entree, I made baked teriyaki chicken, one of my favorites. I’m talking juicy thighs with a delicious teriyaki sauce glazed on. 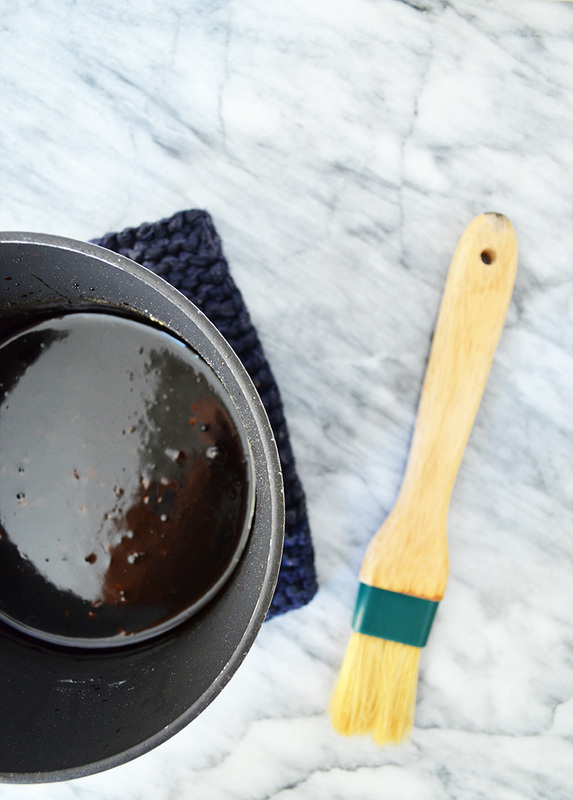 This sauce is spectacular and so easy. All you do is mix in all the ingredients and cook until it thickens. Get in touch with your inner Picasso (or kindergartner self) and brush the sauce on top of the chicken. 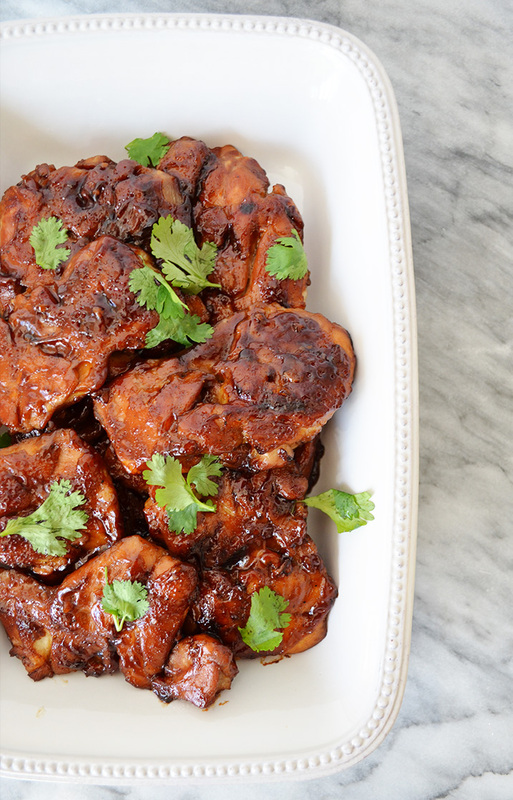 The end result is juicy chicken thighs, covered in a delicious teriyaki sauce. 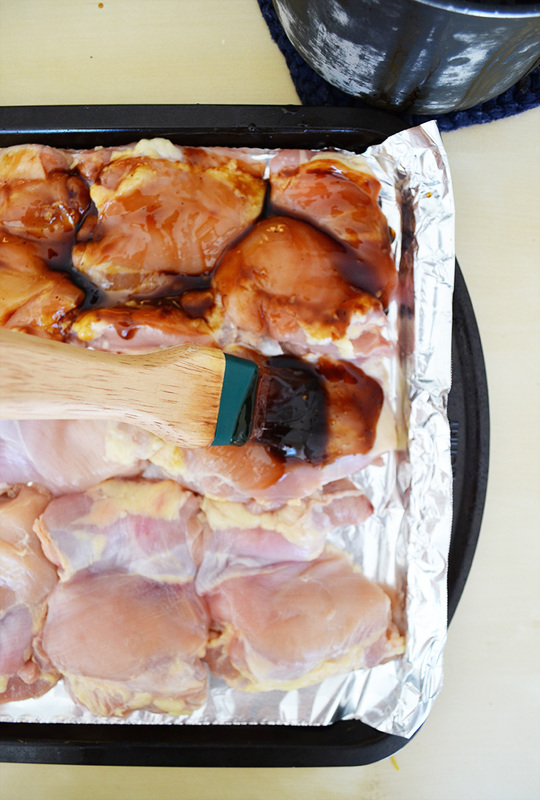 Rinse and pat dry the chicken thighs, then lay them flat on a baking sheet lined with foil. In a small sauce pan, whisk together the water and cornstarch, then mix in the rest of the seasonings. Over medium heat, bring the sauce to a boil and allow it to cook for 3-4 minutes, until it thickens. Take it off the heat and set it aside. With a pastry brush, brush the sauce over the chicken thighs. Bake it in the oven for 50-55 minutes, brushing the chicken every 10 minutes (set your timer!). Flip halfway through to brown the other side. Plate, and serve warm. This entry was posted in Entrees and tagged chicken. Congratulations on your new job! I’m sure it must be exciting and scary to move across the country! 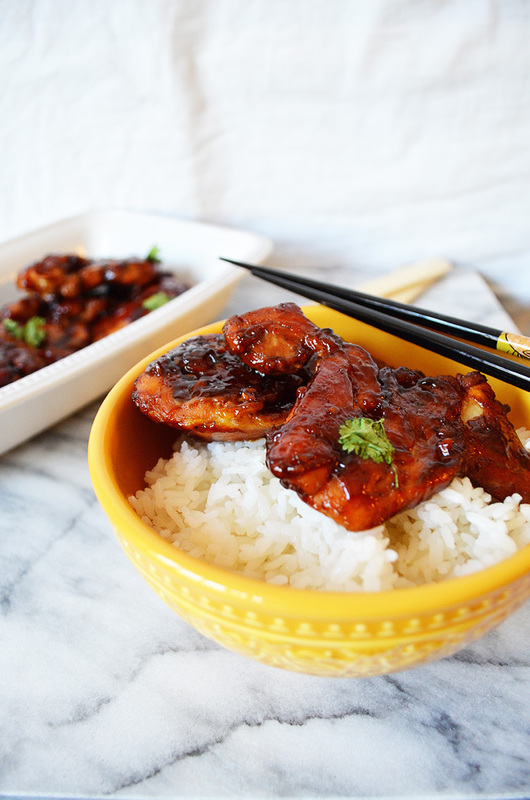 This teriyaki looks amazing! Such beautiful pictures, and I’m sure it tastes delicious! Thank you so much Gayle!! I am definitely very excited and a whole lot of nervous (: The chicken is delicious! I am eating the leftovers as we speak! Thanks so much Danielle! I hope you both enjoy the recipe! Wow, this chicken looks amazing! I know everyone here would love these.